Anthropogenic activities in New England salt marshes have altered hydrologic flows in various ways, but unintended consequences from some types of habitat modifications have received little attention. Specifically, ditches have existed on salt marshes for decades, but the effects of these hydrologic alterations are only poorly understood. Ditch-plugging is a more recent methodology used for salt marsh habitat enhancement and mosquito control, but the long-term effects from this management practice are also unclear. The interactions involving marsh surface elevation, soil characteristics, and hydrologic regimes result in feedbacks that regulate the salt marsh self-maintenance process, and these interactions vary with hydrologic modification. Using natural tidal creeks and pools as controls, we examined the effects of ditching and plugging, respectively, on hydrology, surface elevations, and soils. Results showed the most apparent effects of altered hydrology from ditching are prolonged pore-water retention in the rooting zone and significantly lower soil bulk density and mineral content when compared with natural creek habitat. From a management perspective, the important question is whether the combined alterations to physical and biological processes will hinder the marsh’s ability to keep pace with increasing rates of sea level rise, especially in more heavily ditched marshes. In contrast, ditch-plugging results in the decoupling of feedback processes that promote salt marsh self-maintenance and in doing so, threatens marsh stability and resilience to climate change. High surface water levels, permanently saturated soils, marsh subsidence, and significantly lower bulk density, carbon storage, soil strength, and redox levels associated with hydrologic alterations from ditch-plugging all support this conclusion. We would like to thank Beth Lambert at the New Hampshire Coastal Program and Matt Collins at the NOAA Restoration Center for help with data collection and use of equipment. Additional equipment used for this study was funded in part by the University of New Hampshire Marine Program, and the Wells National Estuarine Research Reserve provided lab space. We thank faculty and students at the University of New Hampshire Jackson Estuarine Laboratory for their assistance, especially Fred Short, Greg Moore, Alyson Eberhardt, and Chris Peter. Additional thanks go to Ray Konisky at The Nature Conservancy. The US Fish and Wildlife Service provided special use permits for work at Chauncey Creek and Parker River marshes, and Bates College and The Nature Conservancy granted permission to work at Sprague River Marsh. This work is dedicated to our co-author, Michele Dionne, a talented scientist, mentor, colleague, and friend who contributed greatly to estuarine research and conservation. Dr. Dionne sadly passed away on July 4, 2012. Jackson Estuarine Laboratory Contribution #512. Bohlen, C. 2007. 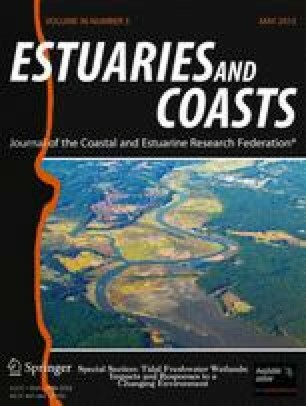 Sixty years of change in a Maine salt marsh landscape: implications for restoration. http://abacus.bates.edu/cbohlen/research.htm. Accessed November 2011. Turner, R.E. 2010. Beneath the salt marsh canopy: loss of sediment strength with increasing nutrients. Estuaries and Coasts. doi: 10.1007/s12237-010-9341-y.